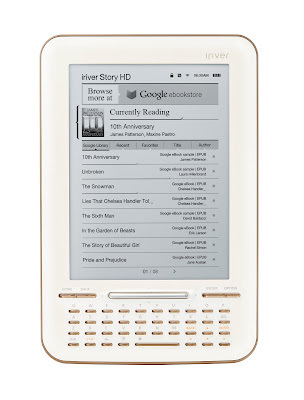 Starting this coming Sunday, July 17, the iriver Story HD e-reader will be available for sale in Target stores nationwide and on Target.com. 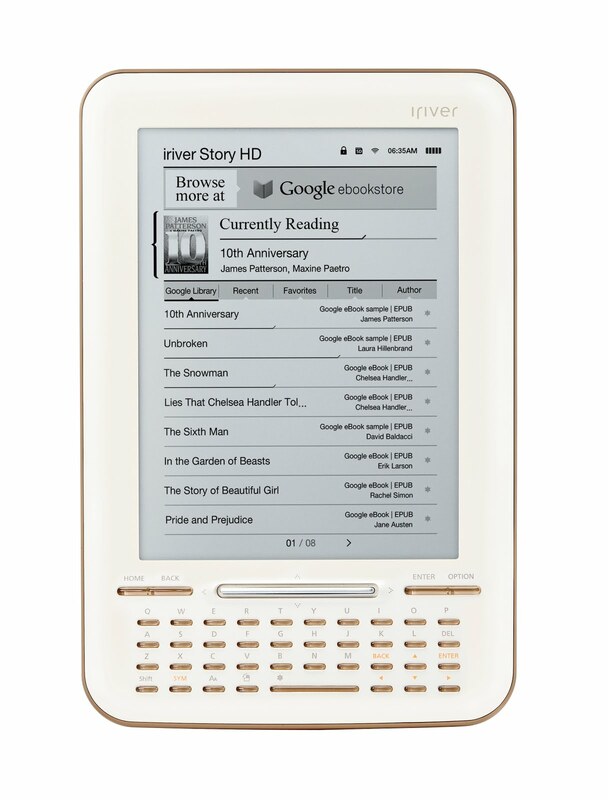 The iriver Story HD is the first e-reader integrated with the open Google eBooks platform, through which you can buy and read Google eBooks over Wi-Fi. The iriver Story HD, which retails for $139.99, is slim and lightweight with a high-resolution E Ink screen and a QWERTY keyboard for easy searching. It includes over-the-air access to hundreds of thousands of Google eBooks for sale and more than 3 million for free. With the Story HD you can now browse, buy and read Google eBooks with your e-reader through Wi-Fi, rather than downloading and transferring them from computer to e-reader with a cord as you can already do with more than 80 compatible devices. We built the Google eBooks platform to be open to all publishers, retailers and manufacturers. Manufacturers like iriver can use Google Books APIs and services to connect their devices to the full Google eBooks catalog for out-of-the-box access to a complete ebookstore. You can also store your personal ebooks library in the cloud—picking up where you left off in any ebook you’re reading as you move from laptop to smartphone to e-reader to tablet. In December, Google eBooks launched with the ability to read Google eBooks on any device with a modern browser, on Android and iOS devices using the Google Books mobile apps, through our Chrome Web Store app and on compatible ereaders. Since then, we’ve added new retailers—growing to include more than 250 independent bookstores—and made Google eBooks available in Android Market. We’ve also extended our affiliate network and updated our family of Google Books APIs. The Story HD is a new milestone for us, as iriver becomes the first manufacturer to launch an e-reader integrated with Google eBooks. You can learn more about the Story HD on the iriver website. Stay tuned for more Google eBooks-integrated devices to come. If you’re a manufacturer interested in integrating your next device with the Google eBooks e-commerce platform, please contact us at books-devices-request@google.com. Update 7/13: We've corrected the word "e-ink" to the more precise "E Ink" as that is the technology brand used in the device's high resolution screen.